Near the sacred island on which the ram-headed ancient Egyptian god Khnum was once worshipped stands the West Sehel village erected 120 years ago before the Aswan Dam was built at the beginning of the last century. It lies in Nubia, where Khnum was once revered as the god of the source of the Nile, the creator of humankind and fertility. The village lies on the west bank of the River Nile and takes its name after the sacred island on which was also built the Temple of Anuket, the goddess of the Nile’s cataracts. Today, the Nubian people of West Sehel have been able to draw increasing numbers of tourists to their village through creative and visionary plans. 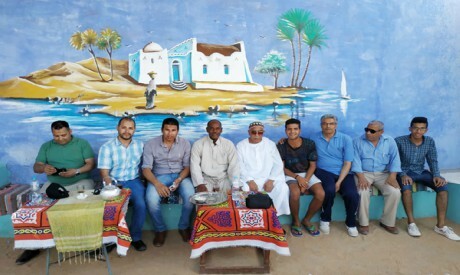 Holidaymakers whose regular destination had been Aswan now receive information about this Nubian village that has maintained its traditions and preserved its natural habitat. More and more now opt to visit the village and be introduced to its cultural wealth. Visitors can reach the village, some 15km south of Aswan and near the airport, either by land by crossing the Aswan Dam Bridge or by boat along the Nile. The latter is the preferred means of transportation. The boats dock at Berber where a convoy of camels awaits the travellers to take them to the village to spend a day in Nubian houses, embark on a shopping tour among the bazaars selling Nubian spices and handicrafts, do some sand-skiing, and experience Nubian life and customs. Beit Nasser, Nasser’s House, is one of the landmarks of the village. The house is an embodiment of the Nubian heritage, and visitors are able to watch the alligators tamed and raised in many Nubian houses and to feed them. Most are small or medium-sized. Tourists can also enjoy the delights of Nubian cuisine, including cheeses, molasses and the famous Nubian sun bread. 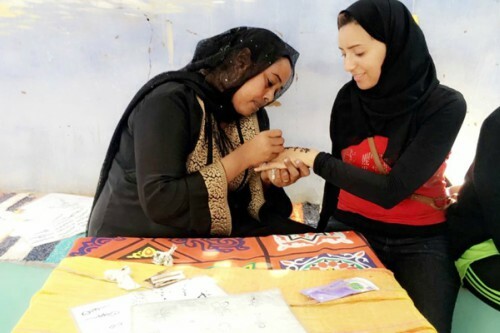 In addition to the henna tattoos offered by the skilled women of the village, visitors to Nasser’s House can see a display of Nubian wicker handicrafts, embroidery and traditional garments. “I’ve been working in the field of tourism for 11 years now,” said Hamdi Korashi, originally an irrigation employee and currently the owner of the second hotel built in the village. “I built the Nubian eco-lodge, the brainchild of Nubian singer Mohamed Mounir’s older brother. The eco-lodge is themed so that each room bears the title of one of Mounir’s songs,” he added. “The eco-lodge houses 20 rooms. It costs LE700 per night per person, including transportation and itineraries. One-day visits are the most common among foreign travellers,” Korashi added. “Vacationers come to the village in winter and summer, despite the scorching sun. During the tourism industry’s heyday, we received 6,000 visitors per month. Usually, travellers arrive at West Sehel village at 6am and leave by 8pm,” said Qassem Mohamed, a resident of the village. “The architecture of the traditional Nubian houses often employs domes. The houses are built with mudbricks or in Aswan stone, allowing fresh air inside. They are very healthy houses, where the sun is kept out and the air is renewed, making them very suitable for foreign visitors, especially during the summer,” Mohamed explained. Despite the fact that the village is new to Egypt’s tourism map, it has already covered many miles of development. It has been marked on many itineraries and now houses 10 eco-lodges. It is also a favourite destination of various celebrities for wedding ceremonies and special occasions and has become a preferred location for filmmakers to shoot films and TV series. “West Sehel has made a name for itself in guidebooks and tourism magazines. Many travellers come to the village in winter to cure ailments such as bone problems and rheumatoid arthritis, both of which can be relieved by immersing the body in the village’s warm sands,” said Alaa Badri, a tour guide.